***This article originally appeared on ctlt.ubc.ca. The Aboriginal Un-History Month exhibition, which was on display this year from June to the end of August at the Irving K. Barber Learning Centre, brought together Indigenous work, resources and collaborations from across campus. 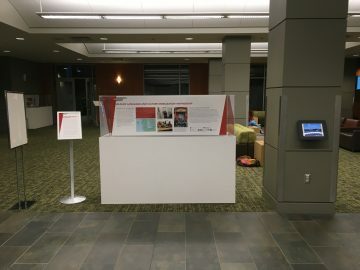 Additionally, this year’s exhibit held a space for those who passed by to consider the juxtaposition of our current location, historical context and social relations. According to Sarah Dupont, the Aboriginal Engagement Librarian at UBC, the annual event is a good way to showcase the conversations that are happening at UBC and highlight the ongoing relationships, projects and collaborations that extend past UBC Point Grey campus. Some of the annual event’s consistent partners have been the Native Youth Program (NYP), the Centre for Teaching, Learning and Technology (CTLT) and the Musqueam First Nation. The concept of (un)history has been used by the team to challenge the designation of Aboriginal History Month that the Canadian government has granted to the month of June. This designation, while an important measure to recognize Indigenous people in Canada, also contributes to the persistence of a stereotype that Indigenous Canadians’ role in nation building was only a historic one. This year’s theme, Whose 150? challenged this stereotype and created a space for people to contemplate this question. This year the team was given the opportunity to have a dialogue about Canada’s 150th anniversary. “Several of my colleagues in the UBC Library were thinking about the 150th anniversary in terms of our relationship on unceded Musqueam territory and what it means to be working at a university and to be inhabiting this space,” explains Dupont. With this in mind, the (Un)History team decided to bring that dialogue into a more central space and to facilitate broader engagement around the topic. When creating the exhibition, the curatorial partners wanted to introduce the audience not only to the work, programs and projects that are taking place on campus, but also invite them to think about how they fit into this conversation at UBC, as a student, staff member, faculty member, and as a community member. The Musqueam First Nation curated three of the cases on display for the exhibition. One of them told the story of Musqueam, specifically of the land. The second case talked about the curriculum resources developed by the community that are available for youth and borrowed through the Museum of Anthropology. The third case curated by Musqueam was a conversation about the c̓əsnaʔəm exhibit that is still ongoing at the Museum of Vancouver. The exhibit was the focus of the Aboriginal Un-History Month exhibition in 2015. “The emphasis of Musqueam’s ongoing efforts to assert rights as a First Nation is a really important conversation to keep having in the Learning Centre, as it is an multidisciplinary gathering space for all students. It is an opportunity for students to learn about and reflect on what it means when Elder Larry Grant says Musqueam has been here since time immemorial. Students have a responsibility to understand the perspectives of Indigenous peoples on whose traditional territories they are learning, here and now as students, and wherever they may go in the future as alumni of this institution,” added Dupont. Pam Brown, Curator, Pacific Northwest at the Museum of Anthropology (MOA) and the Director of the Native Youth Program (NYP), has been involved with the Aboriginal Un-History Month exhibition since it launched five years ago. NYP is a summer program for urban aboriginal youth (ages 15-18) currently enrolled in secondary school. It provides summer employment and training to 6 urban Aboriginal high school students and 2 UBC students as program manager and research assistant. The goal is to produce young aboriginal leaders, provide meaningful direction and mentoring, enhance employment opportunities for aboriginal youth and promote public understanding of the diversity and richness of aboriginal cultures within the UBC community. While the core program is consistent year to year, evolution in project learning and innovation in partnerships and use of digital media delivers new elements. The NYP project that was showcased in this year’s exhibition focused on comic animation. The youth had a week-long intensive workshop with Mohawk artist Skawennati at Emily Carr University of Art and Design where they learnt digital storytelling and made a machinima. In addition to her work with the NYP, Brown continues work on a five-year Heiltsuk Language and Culture Collaborative Documentation and Digitization Project with the Heiltsuk Cultural Centre in Bella Bella. Co-participants include Mark Turin from UBC’s First Nations and Endangered Languages Program; Kim Lawson, Reference Librarian, Xwi7xwa Library; Gerry Lawson, MOA’s Oral History Language Lab Coordinator; and Lisa Nathan, Assistant Professor at UBC’s School of Library, Archival and Information Studies and Coordinator of the First Nations Curriculum Concentration. Heiltsuk Co-participants include Jennifer Carpenter, Director, the Heiltsuk Cultural Centre, Frances Brown, Heiltsuk Language Teacher, Bella Bella Community School and Rory Housty, Language Teacher, Heiltsuk Community College. The project continues to support the Heiltsuk First Nation in seeing their cultural archives and language resources digitized, inventoried, and connected with audiences and practices, both Indigenous and non-Indigenous, through a resource portal. The project involves teaching the language in Bella Bella and Vancouver in the near future, and developing technologies and digital educational resources in the community that will support innovative language dissemination at MOA. Dupont believes projects like this one are shifting the ways in which First Nations and universities interact. “Indigenous participation in research design and attribution is becoming a more commonly expected approach for researchers to take. Now, we see examples of research relationships that have been struck in ways that directly contribute to the expressed needs of First Nation, rather than just the direct research interests of the researcher. Though there are still areas and examples where there can be inequalities in the researcher-participant relationship, respectfully-constructed and conducted projects, like the Heiltsuk language mobilization project, demonstrate a shift in how the academy is viewing its valuation of reciprocity in its relationships with First Nations,” explained Dupont. Indigitization was featured in this year’s exhibition of Whose 150? as it uniquely repositions the role of the university as a contributor to the preservation and digitization of First Nations cultural heritage. “As publically funded institutions, academic libraries focus on collecting materials from people and communities. Thanks to an endowment by Irving K. Barber, special funding allows for the in situ digitization of First Nations cultural heritage content by community members. This eliminates the barrier of making culturally sensitive materials publically available, while still addressing a timely need to stabilize and make available extremely valuable content accessibly to appropriate community members,” says Dupont.